After the Adirondacks on Saturday and an out-of-place oriole on Sunday why not my first two longspurs on President’s Day? Will, who you met Saturday, and I raced down the New York State Thruway President’s Day morning to meet Mike. Our mission was to find the Lapland Longspurs and Smith’s Longspur that have been frequenting Jones Beach for the last couple weeks (so we’re slow-motion twitchers). The Smith’s Longspur, a more Midwestern bird, is not usually seen in New York, in fact, this is only the second recorded instance of of the species in the state. This bird is steady too, somebody (usually many somebodies) had seen it on 14 of the 15 days before we arrived. We met Mike at the Coast Guard Station, hoping to find a Red-necked Grebe that has been in the area. It was cold and the wind was blowing. The chop in the bay was serious and only Buffleheads were on the water. We moved on, seeing Yellow-rumped Warblers feeding on the short grassy shoulders and a couple Horned Larks. The parking lot at the nature center was closed so we foolishly parked at West End 2 (instead of just staying put at the much closer lot by the Coast Guard Station) and walked through the wind and cold to the reputed refuge of the longspurs. We weren’t the only ones. At least five other birders, including Ed Coyle, who originally discovered the Smith’s Longspur, were looking too. Ed was kind enough to get us on the Lapland Longspurs (a lifer!) but the Smith’s Longspur remains unticked on my checklist. It was a cruel blow lessened somewhat by the scads of Snow Buntings, Horned Larks and Lapland Longspurs. Black-bellied Plovers rested amid the grass tufts and a distant Northern Harrier hunted to assuage the hunger that the cold must have sharpened. On the cold walk back to the car a Sharp-shinned Hawk streaked across the road into the trees ahead of us. We conferred about our next move and decided to head over to Point Lookout, another birding hotspot a short drive to the west. En route we spotted a Great Cormorant and several Double-crested Cormorants next to the causeway…as the driver, I only got a lousy look at what was my second Great Cormorant (I had a lousy look at the first one too). As soon as the words left my mouth I looked for a piece of wood to knock on, but, this being a beach, there were no trees, not even driftwood. How could I have laid such a horrible jinx on as nice a guy as Mike? Ah well, we were there to bird. Small numbers of Sanderlings dashed about and Brant and Red-breasted Mergansers were ubiquitous. 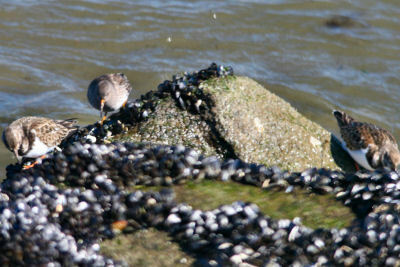 At the first of three rock jetties (prime habitat for Mike’s avian adversary) there were no Purple Sandpipers. We did see some dainty Bonaparte’s Gulls, probably my favorite gull for they are not rare, but not an everyday gull either, and when they vocalize they sound like someone doing a bad imitation of Donald Duck. At the second jetty there were, once again, no Purple Sandpipers but there was a Horned Grebe. At the third and largest jetty (where beach meets inlet) there were, once again (say it with me now), no Purple Sandpipers (Doh!). A fly-by Long-tailed Duck, a Red-necked Grebe (so that’s where it went) way out in the water, several more Horned Grebes and a Common Loon in its drab winter plumage were our consolation prizes. Back at the cars we parted ways…Mike was done birding for the day and Will and I had another stop to make in search of rare waterfowl before heading northwards for a shot at the Piermont Snowy Owl on the way home. Check back tomorrow to see if we were successful. Like I said, Corey, I’ve never NOT seen life birds when you’re around. Great trip, though I’m looking forward to warmer conditions next time! Great write-up as well.